Popular Buckeye Historian Jack Park will be our guest speaker at the Franklin County OSU Alumni Club annual banquet on Thursday, May 11. The banquet will recognize our newest scholarship winner and celebrate the accomplishments of the club throughout the past year. 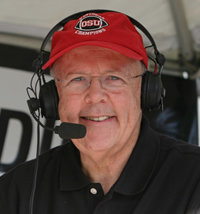 Jack Park is a noted OSU football radio personality, historian, best-selling author (“The Ohio State University Football Vault” among several other titles), and local television celebrity. He can also be found in the Sports pages of the Columbus Dispatch. His enthusiasm for Ohio State is exceeded only by his great knowledge of its history. The banquet will be held at Mozart’s Café, 4784 N High St in Clintonville. Cocktail hour will begin at 5:30 pm, with a buffet dinner at 6:30 pm. The registration deadline has now passed. Questions? Please email osualumnifranklincounty@yahoo.com.